10% off the first order (contact the support). This review has not yet been approved by the owner of this writing service. If you are the webmaster of Topqualityessays.com, please Contact Us to approve or remove this review. The website lacks some essential information about the way the service functions. Price calculator isn’t very useful (it, for examples, constantly resets half the boxes you have already filled in when you make some change that is not supposed to lead to such result). In general, too much filler text scattered everywhere, too little relevant information. 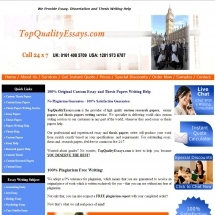 Prices depend on the academic level of your assignment and time left until the deadline, and generally seem to be ridiculously low: from $9.95 to $37.95 per page, the latter being a doctoral level essay due in 24 hours. Do you really believe a person with a doctor’s degree and good knowledge in the subject will write your essay for about $30 per page if not less (the service takes a large portion of the fee)? Support is a disgrace. You can contact them via the query form on the site or through chat. I don’t know about the form, but the chat operator is extremely erratic in his behavior: he appears, disappears, answers and ignores your questions at random. I was rarely able to make any sense of what he was saying, and what’s worse, I always seemed to bump into the exact same person. There are two samples on the website and, although it is not nearly enough to form a comprehensive impression, they can provide some insight. They are written without obvious factual, formatting or grammar mistakes, but seem to be rather bland and mostly consist of definitions – probably taken from the sources. Not very impressive. 10% discount on the first order, 15% on the second one. The service doesn’t look very trustworthy. Ludicrously low prices (several times lower than they can realistically be) suggest that the papers are written by anyone but “professional academic writers with PhD degrees in everything”, poor quality of text on-site, unprofessional design, erratic behavior of customer support, lack of useful information – all this leads you to a conclusion that it is not the brightest idea to entrust anything but the least important and urgent assignments to this agency. And these only for the sake of experiment.